I just realized that I took the pictures and I forgot to add the chick peas…too late! I love this dish, I wouldn’t have thought I would have loved it so much but the cauliflower “semoule” goes so well with it. 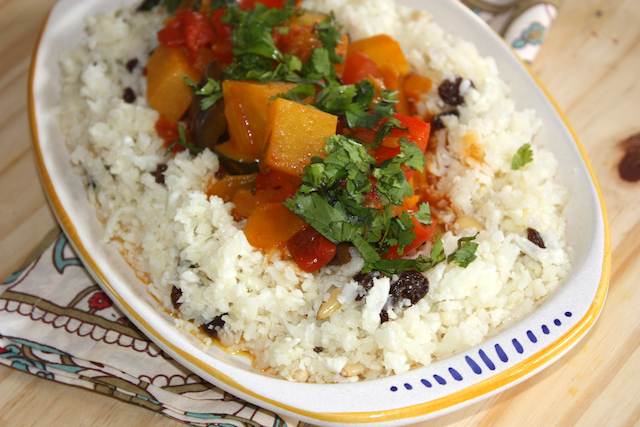 There is a little confusion when translating couscous from French into English. For us, French people when we talk about couscous, it refers to the Middle Eastern dish (vegetables/meat stew + semoule) and not only the little wheat grains that in the US they call couscous. What people call couscous in the US, we call it “semoule” or semolina. As usual, being a huge eater of vegetables, I thought to substitute the couscous (wheat semolina) with cauliflower. I was wondering if the flavor wouldn’t be too strong. The truth is, it was not, it was just perfect. If you want to consume less starch, don not hesitate to use cauliflower in couscous, it works perfectly. The vegetables need to be cut in larger pieces, over one inch, maybe 1.5 inches. I found the same harissa as we use in France in a Middle Eastern store. Harissa is a middle eastern hot chili sauce made out of roasted peppers, hot chili peppers, and many other herbs and spices. You can equally make it. If you cannot find harissa, you can use any chili based hot sauce to add at the end. Heat olive oil in a large pot. Add onions and cook until soft, then add garlic. Add tomato paste and stir well. Add all vegetables except chick peas, and add some water. Add all spices, mix well and cover with lid. Let cook at medium heat for about 20-30 min until vegetables are cooked but not mushy. When cooked, add chick peas, drizzle with olive oil, cilantro and serve hot. Using a food processor, grate cauliflower on the same blade you would grate carrots. Bring large pot of salted water to a boil. Pour cauliflower and cook for 3 minutes. Remove from heat and drain. Keep warm. Add pine nuts, raisins. Adjust with salt and pepper. 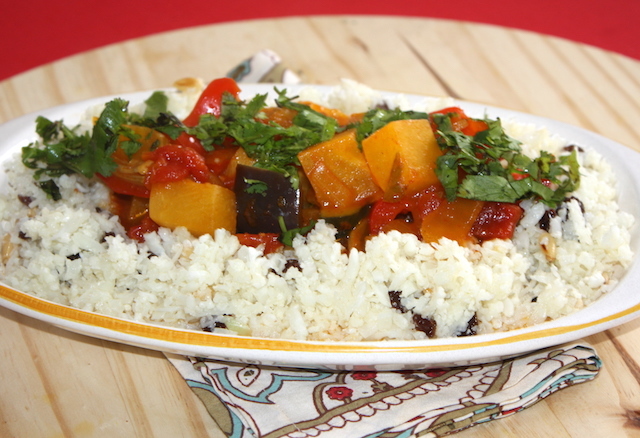 Eat with vegetable stew and that’s what we call couscous! This entry was posted by silvia on June 7, 2017 at 1:36 am, and is filed under Misc recipes, Vegan, Vegetables. Follow any responses to this post through RSS 2.0.You can leave a response or trackback from your own site.